Scientists have found a treasure trove of tiny fossils in the rocks of Greenland. The microscopic organisms date to more than half a billion years ago, offering new insights into the Cambrian Explosion, a dramatic increase in the planet's biodiversity that began 541 million years ago. During this period, Earth's shallow seas teemed with life, and the first modern ecosystems formed -- animal and plant life as we recognize it today was born. The details of this dramatic evolution have been revealed by world-famous excavation sites like the Burgess Shale, a bed of shale exposed in the Canadian Rockies. 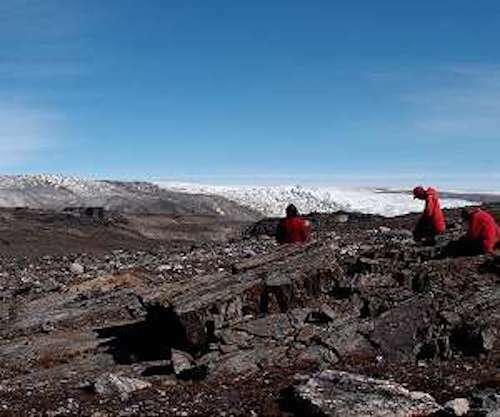 Similarly aged strata has also been found in Greenland, but most of the fossils at Sirius Passet belong to larger creatures and hard-bodied organisms. Heat generated by tectonic activity over the last 500 million years has melted Greenland's rocks several times, destroying much of the fossilized evidence of soft bodied organisms from the Cambrian Period. But a team from Uppsala University in Sweden discovered an outcropping of rocks that escaped much of the heating and subsequent damage. There, just south of Sirius Passet, an acid extraction procedure used to dissolve layers of mudrock revealed a multitude of tiny fossils representing soft-bodied Cambrian life. The rocks are filled with tiny fossils, most of them smaller than a millimeter in length and requiring a microscope for examination. Among other fossils, researchers discovered the preserved hook-like teeth of priapulid worms, which the predators used to burrow into the mud in search of prey. Scientists found fragments of the oldest known pterobranch hemichordate, a rare group of tube-dwelling filter feeders. The rocks also revealed fossilized defensive spines belonging to a variety of arthropods. Researchers described their impressive fossil haul in a new paper published this week in the journal Geology. "The sheer abundance of these miniature animal fossils means that we have only begun to scratch the surface of this overlooked resource, but it is already clear that this discovery will help to reshape our view of the non-shelly animals that crawled and swam among the early Cambrian seas more than half a billion years ago," Uppsala researcher Sebastian Willman said in a news release. 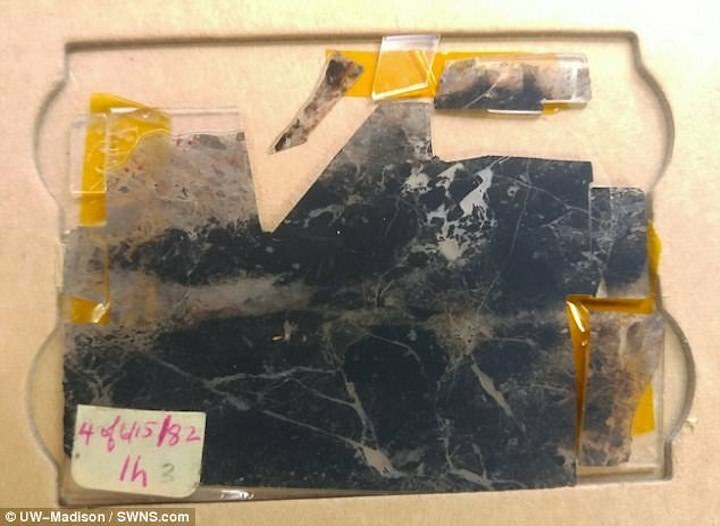 The oldest fossils ever discovered suggest life on Earth began at least 3.5 billion years ago in modern day Australia, a new study claims. Experts claim to have confirmed that microscopic fossils are the oldest ever found and the earliest evidence of life on Earth, before an oxygen atmosphere existed. The revelation could suggest that the microbial lifeforms may be widespread in the universe. The microfossils - so called because they are not evident to the naked eye - were first described in the journal Science in 1993 by Professor William Schopf. His team identified them based largely on the fossils' unique, cylindrical and filamentous shapes. Professor Schopf, director of UCLA's Centre for the Study of Evolution and the Origin of Life, published further supporting evidence of their biological nature in 2002. He collected the rock in which the fossils were found in 1982 from the Apex chert deposit of Western Australia, one of the few places on the planet where geological evidence of early Earth has been preserved. Professor Schopf's earlier interpretations have been disputed, as critics argued they are just odd minerals that only look like biological specimens. But Profess John Valley, of the University of Wisconsin-Madison. says the new findings put these doubts to rest - the microfossils are indeed biological. The findings were made by researchers at UCLA and the University of Wisconsin-Madison. Their study describes 11 microbial specimens from five separate organisms, linking their form and structure to chemical signatures characteristic of life. Scientists say some represent now-extinct bacteria and microbes from a domain of life called Archaea, while others are similar to microbial species still found today. They say the results show that the microfossils are from a primitive, but diverse group of organisms, which could be widespread throughout the universe. They also suggest how each organism may have survived on an oxygen-free planet. The team identified a complex group of microbes, including phototrophic bacteria that would have relied on the sun to produce energy. It also includes Archaea that produced methane and gammaproteobacteria that consumed methane, a gas believed to be an important constituent of Earth's early atmosphere. The findings were made using a state of the art secondary ion mass spectrometer (SIMS) - one of just a handful of such instruments in the world. Using this, the team was able to separate the carbon composing each fossil into its constituent isotopes and measure their ratios. Isotopes are different versions of the same chemical element that vary in their masses, due to a different number of neutrons in the nucleus of each atom.